Earlier known as ‘Tippera’, Tripura is one of the seven states in the north eastern belt of India, often referred to as the ‘Seven Sisters’. Tripura’s physical features differ from north to south with high hills interspersed with valleys and rivers. Ruled by the Manikya Dynasty for more than 3000 years, its earlier royal status can be seen in regal palaces, gardens, well-kept parks, and in the way the people of this beautiful state continue to live in harmony with their environment. Mentioned in the Mahabharata, the Puranas and even the pillar inscriptions of Mauryan Emperor Ashoka, Tripura’s historic past and unique tribal culture is the stuff of fascinating folklore. A legend claims that the territory is named after the Tripuri Sundari temple, located at Udaipur, 55 km from Agartala. Dedicated to Goddess Kali, it is the holiest Hindu pilgrimage site in Tripura. The temple is more than 500 years old and was built in 1501 AD by Maharaja Dhanya Manikya. Tripura merged with India in 1949 and attained full-fledged statehood in 1972 – this is when the grand Palace of the Manikya Dynasty in Agartala, became the state’s Legislative Assembly. While officially there are no Rajas, the royal family has continued to crown their leaders. Young scion of the Manikya Dynasty, Pradyot Deb Burman Manikya Bahadur, succeeded to the ‘royal gaddi’ as recently as 2006. Agartala is a comparatively new capital for Tripura and is located at the western end of the state, just 2 km from the Bangladesh border. Earlier, the only way to reach Agartala from Kolkata was by train, which meant travelling around the Bangladesh borders. Historically the earliest capital was Rangamati, located on the banks of River Gomti in South Tripura. Agartala came into being much later when it was decided to shift the capital to a location that offered better access to British Bengal. It was during the reign of Maharaja Bir Chandra Manikya (1874) that the state capital of ‘Hill Tippera’ was accorded the status of a municipality with an area of 3 square miles and a population of 9,513. However, it was only after Maharaja Bir Bikram Manikya Bahadur came to the throne in the forties, that the planned city of Agartala began to take shape. After restructuring, the city spreads across a plain along the River Haora to the hills at the northern end – an area stretched across 58.84 metres. The beautiful Ujjayanta Palace,the home of the ruling Manikya Dynasty, is located at the centre of the city. It covers an area of one square km and was built between 1899 and 1901. A two-storied mansion, it may be considered a combination of Mughal and Colonial architecture, with three high domes – the central dome rising to a height of 86ft. The palace has magnificent tiled flooring, a carved wooden ceiling and is set within huge gardens. Over the years we have all seen the talent and artistic flair of the members of the Tripura royal family. For instance famous singer Sachin Dev Barman was the son of Maharaja Ishanachandra Manikya Dev Burma and later his son Rahul Dev Barman followed in his footsteps. Hence, it was not surprising that Maharaja Birendra Kishore, who was a gifted artist decided to create a retreat for himself, a short distance away from the Palace. In 1917, he designed and supervised the building of a beautiful mansion surrounded by a large garden, located a kilometre north of the Palace, on a green hillock and named it ‘Pushbanta Palace’. This palace is now the official residence of the Governor of Tripura. Rabindranath Tagore who was a frequent visitor, stayed in a bungalow adjacent to the Palace, known as ‘Malancha Niwas’. It is said that the location inspired many of Tagore’s literary works and the garden was where he composed many of his popular songs. Part of the Palace garden has been opened to public and has been renamed ‘Rabindra Kanan’. One of the popular sights worth seeing near Agartala is the Rudrasagar Lake, a natural lake located 53 km away. Here lies the magnificent Neermahal Lake Palace, constructed as a summer getaway by Maharaja Bir Bikram Kishore Manikya. This is the only lake palace in the north east of India and is built on a lake spread across an area of 5,35 sq metres and attracts a large number of migratory birds in winter. Seepahijala is another unique location just 20 km from Agartala. The palace here is surrounded by a natural lake where boat rides are very popular. More than 150 species of birds can be seen here at the nearby dense forest. A deer park and a mini zoological garden is a big attraction. Another vast lake is Kamalasagar, excavated in the 15th century by Maharaja Dhanya Manikya, is located at the Bangladesh Border. The Kali temple on the banks attracts large numbers of devotees. However, the most interesting location that must be visited, lies 178 km away. This is ‘Unakoti’, where one can see unique rock carvings and murals of surprising beauty, dating back to the 7th and 9th centuries. The images here are of two varieties – some are carved on rock while others are made of stone. . Among the rock-cut images the 30 ft high Central Shiva head and the gigantic Ganesha figure deserve special mension. Numerous other carvings and figures make Unakoti’s unique. A popular fair, the Ashokashtami Mela, draws millions in the month of April every year. Another treasure house full of Hindu and Buddhist sculpture is ‘Pilak’, located 100 km from Agartala. 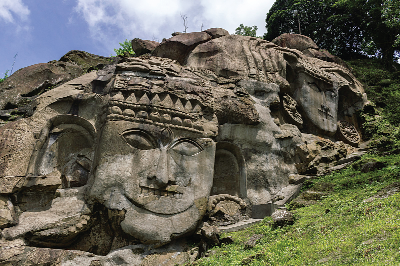 This archaeological site represents both Hinduism and Buddhism co-existing peacefully. Artifacts of Hinduism are in the form of sculptures and plaques of Hindu gods. These include Shiva and Surya. There are also very large stone sculptures of Narasimha and Avalokiteshvara. The museum offers much to see - antiquities pertaining to the H=inayana, Mahayana, Vajrayana Buddhist practices. The site is also strewn with a large number of terracotta plaques. The site is now under the Archaeological Survey of India and a visit should be high on any list of ‘must-sees’ in Tripura.